Let us introduce you to the new generation of cooking – the sous vide cooking thanks to the Sous Vide Supreme Demi. This kind of cooking will become a favorite of yours in no time. First of all, the cooking preparation time is significantly reduced. Season the food, vacuum it, place it in the Sous Vide Supreme water oven and don’t worry about it. There is no need to check on it, or worry about overcooking. Is this something you’d like to try in your household? Keep on reading to discover the best Sous Vide on the market. How Does a Sous Vide Work? How To Make a Sous Vide Water Bath? Where To Buy a Sous Vide Machine? About the size of a bread machine, Sous Vide Supreme Demi won’t take up much space. Therefore, you’ll be able to keep Sous Vide on your kitchen counter. It will most certainly become a part of your cooking routine. Sous Vide Supreme Demi has a sleek all-in-one design, and comes in two different colors: black and red. What you’ll notice on Amazon (or in other store of your choice), the red Sous Vide is a bit pricier. Sous Vide Supreme Demi offers a superior design. It has a coated steel shell, as well as polished aluminum lid. As for the interior design, Sous Vide machine has an anodized aluminum interior. It comes with a universal pouch rack. Once you vacuum the food in the bags, you place them into the pouch. The Sous Vide pouch keeps the food in place while cooking, which gives an even result. The secret of Sous Vide cooking is in the way the water transfers the heat. As opposed to the regular oven, the water in your Sous Vide water oven machine processes the food more efficiently. During the cooking process, the heat reaches the food about 10 times more efficiently than air. Unlike with other normal oven, there’s no need to check on Sous Vide Supreme Demi while cooking. Your food will not end up overcooked, thanks to the gentle cooking method. One of the main features of Sous Vide Supreme Demi is the cooking temperature control. The precise cooking temperature control is the essence of Sous Vide cooking method. According to numerous Sous Vide Supreme Demi reviews, overcooking with Sous Vide is impossible. The Sous Vide cooking operation is quiet and effortless. What makes it even more convenient is the Sous Vide LED display. The display gives insight throughout the cooking process. You can set the cooking temperature to your liking at any given moment. The food positioning won’t give you trouble, either. The Sous Vide machine universal pouch rack makes the placement of the food pouches easy. This way, the food is attended evenly every single time you use Sous Vide Supreme Demi. The size of the Sous Vide water oven will not be the issue. For a powerful cooking appliance, it is rather small. The only thing to consider besides it is the pouches vacuum sealer. The pouches vacuum sealer has to accompany the Sous Vide Supreme Demi each time you’re cooking food in it. Dimensions: 11.3 x 10.96 x 12.99 inches. Thanks to energy efficient engineering, Sous Vide Supreme Demi saves your money, as well. In fact, Sous Vide cooking doesn’t require much energy since it’s cooking on low temperature. Approximately, its power is 110-120 volt. Sous Vide cooking is famous for great cooking temperature control. It grants evenly processed food with every use. The cooking temperature is adjustable in increments of 1°, and it ranges from 86°F to 210°F. Place your food into a universal pouch, position it in the pouch rack and set the temperature. This is all it takes to get perfectly cooked healthy food. You can use your Sous Vide water oven for all kinds of food. From fish to stakes – it is absolutely versatile. One of the main advantages of Sous Vide cooking is the lack of unhealthy fats. The food in the pouch marinates in its own juices and seasonings you add. This is why Sous Vide cooking can’t compare to any other cooking method. The high temperature in the oven tends to dry out the food. Sous Vide cooking isn’t as aggressive. The pouches seal all the nutritive food ingredients so they don’t vanish during cooking. What is it that you get with your Sous Vide Supreme Demi? A stainless steel universal pouch rack for the food pouches, to begin with. The universal pouch rack helps place the food appropriately into the Sous Vide Supreme Demi. It also holds the pouches in place, so there’s no danger of food spilling. You also get a detachable power cord, as well as a perforated bottom grill. The bottom grill generates the thermal turbulence. Of course, an in-depth User Manual with instructions and recipes is included. As for the replacement parts which can be purchased separately, there are the vacuum sealer and the pouches. The vacuum sealer makes sure that the pouches are completely closed. It also takes out the air and creates vacuum. You can purchase these additional parts on Amazon, as well as Sous Vide Supreme Demi. Before we proceed to Sous Vide Supreme Demi reviews and ratings, we will address some of the burning questions. Since the sous vide technique is fairly new and rare, it’s only natural that you have doubts. In this section, we give you the most important pieces of information. If you decide to buy the Sous Vide Supreme Demi, the user manual will have all the answers. However, if you’re still hesitant, check out the FAQs section and learn more about the process. 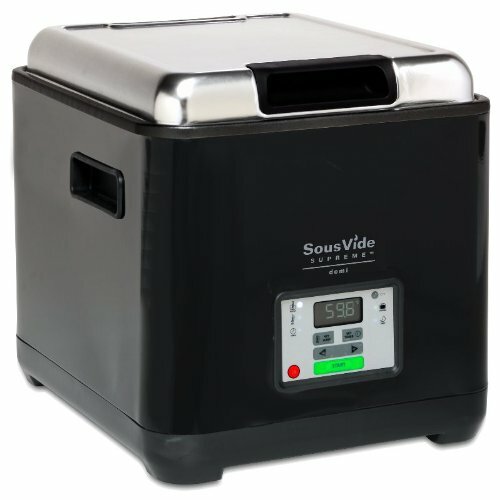 Sous Vide machine is a water oven which uses the water heating system to process the food. According to many positive Sous Vide Supreme Demi reviews, especially on Amazon, it gives a supreme cooking experience. The sous vide cooking technique is an innovation in the culinary world. Not only is it safe, but extremely healthy, as well. One of the main things it offers is absolute temperature control. This means that your food will never be over-processed or dry. It allows the food to retain the nutritive ingredients during the cooking process. Not only is the food healthy and delicious, but also at its best. The best thing about it is that not a lot of effort goes into it. In a few simple steps, your food will be in the kitchen appliance, cooking. First off, prepare the food by seasoning it and adding all the spices and sauces you desire. After doing so, grab one of the food pouches and place the food into it. The next step requires a vacuum sealer. It will help you seal the pouch and create vacuum in it. This way the sous vide cooking technique will be successful. Also, the vacuum will provide protection for natural juices the food produces. This is the secret to great taste. Next, drop the pouch rack into the water bath, set according to the User Manual. Adjust the temperature and let the Supreme Demi do the rest of the work. Once the temperature is set, there’s nothing to worry about. The food will be cooked in a gentle manner, just as much as it should be. There’s no need to check on the food or the device. The way it works is that it regulates the temperature constantly. It brings up the food to a certain temperature, after which you can hold it there until you want to serve it. After you simmer the food in the water bath and it’s ready, serve it and enjoy. One of the things which may sound intimidating is the making of the water bath. However, it’s as simple as it gets. The only thing that you need to consider is the capacity of the Sous Vide water oven. 1. The first thing you need to do is check the water bath. Inside of it, there are two lines: one marked FILL, and other MAX. 2. Fill the water bath with water up to the FILL line. 3. Once you place the pouches into the water, the water will raise. This is why the water level should not exceed the FILL line when you first add it. 4. Once you add the pouches, the water level should not be above the MAX line. 5. If the water level exceeds the limit line, simply remove some of the water. It is important to follow the FILL and MAX guidelines. 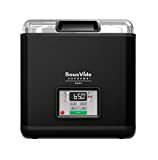 The online source which often offers the best deals, as well as a variety of Sous Vide Supreme Demi reviews, is Amazon.com. Not only can you order your Sous Vide machine, but the replacement parts, too. Everything is extremely easy to find, as it is linked on the page of the product. Below the product description, you will find user Sous Vide Supreme Demi reviews and ratings. It’s safe to say that Amazon offers the best online shopping experience. Note that Amazon does offer the best deals most of the time. As for the regular stores, you will find Sous Vide Supreme Demi in a majority of your local stores. If shopping this way is your preference, you can always find the product in the manufacturer store. You will also find Supreme Demi in the cooking supplies department of Costco; Bed, Bath & Beyond, Walmart, etc. As you know, Sous Vide Supreme Demi’ reviews rarely ever lie on the average. Some of them won’t be genuine because people will rate the price instead of the performance. Some of the bad Sous Vide Supreme Demi reviews are based on the users’ ignorance regarding the water oven. In these cases, people are too lazy to go through the user manual and study the instructions. Perhaps they skip the part in assembling the product, or simply misuse it. That way, it’s no wonder malfunctions occur. However, if you the product received a positive feedback in general, you can easily disregard the negativity. In the case of Supreme Demi, the rating is 4.4 out of 5 stars. In a sea of positive Sous Vide Supreme Demi reviews, the customers mostly praise the taste of the healthy food. They are also absolutely thrown away by the versatility of the device. Most of the users love how easy it is to use. Also, the fact that even some restaurants use Supreme Demi is emphasized. The main complaint focuses on questionable durability of the product. However, it seems to be a rather individual thing. Also, some of the users have experienced water leakage. All in all, the good outweighs the bad, as the positive Sous Vide Supreme Demi reviews are stronger in numbers. The fact which may catch you off guard on the Sous Vide Supreme Demi is the price. The question which emerges from it is whether is Sous Vide worth the money? There are 2 possible answers, none of which is necessarily wrong. As you can already suppose, it depends on your preference. If the taste of the food from the regular oven doesn’t bother you, you can skip on this one. Sous Vide Supreme Demi is great for people who find it hard to get perfectly cooked food. If you don’t have a problem with overcooking your meals, you can stick to your oven. On the other hand, keep in mind that Sous Vide is also a healthier option. No additional oil, and no danger of drying out the food. The outcome will be juicier and tastier. You will not be deprived of the benefits of the sous vide cooking. The vacuum will preserve all the healthy elements. This water oven can change your cooking for the better. The question is whether you want to a change, or you would rather stick to your old ways. Are you familiar with the sous vide cooking? If so, how different is the food you prepare using it? Are the Sous Vide Supreme Demi reviews true, if you have used it? Share your impressions in the comment section.